Published: Jan. 12, 2014 at 01:35 p.m.
San Francisco 49ers linebacker Patrick Willis picks off a deflected pass from Carolina Panthers quarterback Cam Newton in the first quarter. Published: Oct. 28, 2013 at 03:59 a.m.
(13:43) C.Henne pass short middle to M.Lewis to JAX 45 for 6 yards (P.Willis). FUMBLES (P.Willis), RECOVERED by SF-D.Skuta at JAX 47. D.Skuta for 47 yards, TOUCHDOWN. 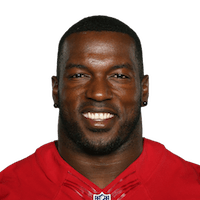 Published: Oct. 27, 2013 at 03:48 p.m.
San Francisco 49ers linebacker Patrick Willis causes Jaguars tight end Marcedes Lewis to fumble. 49ers linebacker Dan Skuta recovers it and takes it 43 yards for the touchdown to help give the 49ers a 42-10 lead over the Jaguars. Published: Oct. 14, 2013 at 05:42 a.m.
(1:16) (Shotgun) C.Palmer pass short middle to L.Fitzgerald to SF 23 for 8 yards (P.Willis). FUMBLES (P.Willis), RECOVERED by SF-E.Reid at SF 11. E.Reid to SF 11 for no gain (M.Floyd). 12-yds of loose ball yardage.